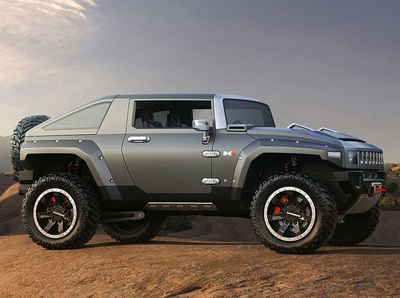 Revealed at the 2008 Detroit Motor Show the HUMMER HX concept is an entry-level HUMMER designed to appeal to the younger buyer. The HUMMER HX is considerably smaller than previous offerings from the brand associated with oversized 4x4's patrolling suburban neighborhoods, and is aimed at other 'lifestyle 4x4's' like the Toyota FJ Cruiser and Jeep Wrangler. HUMMER's bold styling cues all appear on the HX concept including the domineering chrome grille, squared off wheel arches, upright windscreen and removable slanted rear roof. 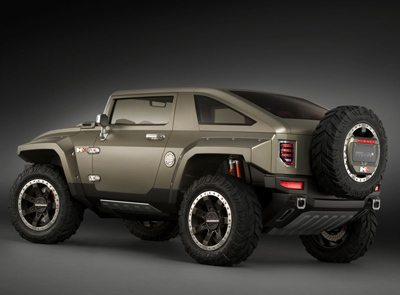 "The HX is HUMMER's vision an agile, trail-ready, open-air vehicle that fits the lifestyles of everyone who needs or wants to drive off road," said Martin Walsh, HUMMER general manager. "Of course, it carries exceptional off-road capability and the distinctive styling for which all HUMMERs are known." For an open air driving experience the HUMMER HX is able to shed its doors and roof to allow the elements in. The HX also was designed with several roof assemblies, allowing the vehicle to be configured as an SUT (with the roof assembly removed), a slant-back or a traditional, wagon-like design that offers a bit more cargo space. The design of the HUMMER HX was driven by input from three young designers who were new to GM and the HUMMER design studio. 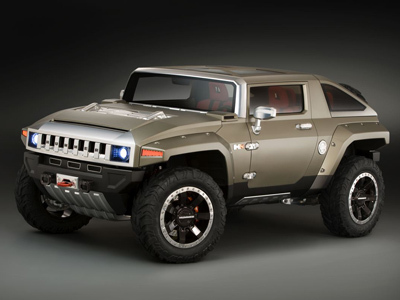 As part of their "initiation," they were charged with developing concept drawings for a smaller, youthful HUMMER and the HX is a direct result of their creativity. The HX concept is based on one of the designers' original illustrations, but incorporates the best ideas and elements from the other designs. The interior design of the HUMMER HX drew inspiration from aircraft interiors. "Aeronautical parts are designed to be both lightweight and strong, and that is the feeling exuded by the HX's cabin," said Stuart Norris, interior design manager. Furthering the aeronautical influence is the instrument panel, which uses an exposed, extruded aluminum cross-vehicle beam as its foundation. On the beam, the instrument cluster and other vital controls are mounted; and it also features a unique, removal top cover that provides significant storage capability.